The inventor of the speculum, J. Marion Sims, is celebrated as the "father of modern gynecology," and a memorial at his birthplace honors "his service to suffering women, empress and slave alike." These tributes whitewash the fact that Sims achieved his surgical breakthroughs by experimenting on eleven enslaved African American women. Lent to Sims by their owners, these women were forced to undergo operations without their consent. Today, the names of all but three of these women are lost. 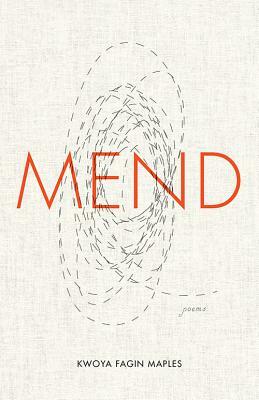 In Mend: Poems, Kwoya Fagin Maples gives voice to the enslaved women named in Sims's autobiography: Anarcha, Betsey, and Lucy. In poems exploring imagined memories and experiences relayed from hospital beds, the speakers challenge Sims's lies, mourn their trampled dignity, name their suffering in spirit, and speak of their bodies as "bruised fruit." At the same time, they are more than his victims, and the poems celebrate their humanity, their feelings, their memories, and their selves. A finalist for the Association of Writers and Writing Programs Donald Hall Prize for Poetry, this debut collection illuminates a complex and disturbing chapter of the African American experience. Kwoya Fagin Maples is a writer from Charleston, South Carolina. She holds an MFA from the University of Alabama and is a Cave Canem Fellow. Her work has appeared in a chapbook, Something of Yours, and in several journals and anthologies, including Blackbird, Berkeley Poetry Review, African American Review, pluck! and Obsidian. Maples teaches creative writing at the Alabama School of Fine Arts.